Southpac hit the ground running for the year by attending the 53rd Annual Heckerling Institute on Estate Planning in Orlando, Florida. The annual event was well attended with over 3,400 professionals sharpening their technical knowledge, particularly in light of the changes to US tax legislation in late 2017. 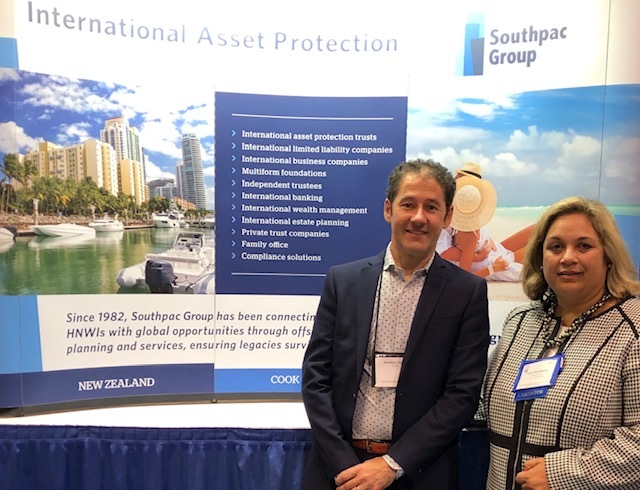 Heckerling is regarded as the key conference for US planners and it didn’t disappoint, with Tarita Hutchinson – Managing Director and Matthew Smith – Legal Counsel talking shop with professionals over the week. Southpac hosted a luncheon and on the agenda was current international events. There were particular discussions around funds provenance and knowing your clients (“KYC”). We take the opportunity to congratulate Dr Mark Monasky – the winner of our business card draw. Dr Monasky, an estate planner and neurosurgeon from Dakota wins a trip to the Southpac Offshore Planning Institute to be held in Nevis in May 2019. Congratulations Dr Monasky. We look forward to catching up with you in May. If any of you are interested in attending our Nevis conference 1st to 3rd May 2019 please contact bsapsford@southpacgroup.com for details.